Well, that’s not exactly true. I do have some great friends who, although not always intentionally, motivate me to do more and achieve more. But we don’t really need anyone to motivate us, because the only successful motivation is self-motivation. It has to come from within. You have to want to do, or achieve something. You need to know what you want out of life, and you have to think about that all the time. 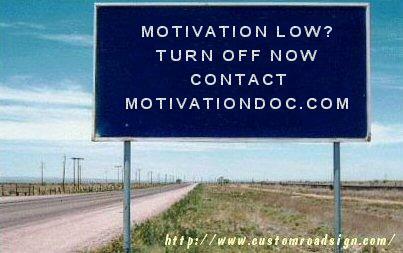 It’s extremely difficult to motivate other people, but you can create the environment where they motivate themselves. It follows, that you can create that environment for yourself. There are triggers and external stimuli you can use to fuel your self-motivation. You can read books, listen to audio programmes and listen to motivational speakers. There are also many small actions you can take, things that you can do that are motivational for you. When I started my business twenty years ago, I could only afford a very basic second-hand car. I cut out a picture of a Mercedes from a magazine a stuck it on the wall above my desk. Whenever I felt a bit low or de-motivated, I’d look at that car and visualise what it would be like to drive. It took me two years, but I eventually bought my new Mercedes. I now have a picture of a very classy 4×4 as the desktop display on my computer and one day I’ll buy that. You don’t have to trigger your motivation with practical things, as long as you keep at the forefront of your mind what it is you really want from your life. What gets you excited! What makes you want to take action! Before you can achieve anything in your life, you need to take charge of your thinking. Take charge of your thinking and you take charge of your life. This entry was posted in motivation and tagged Alan Fairweather, Motivation, motivational speaker, self-belief, Self-esteem, Self-Help, success, Thinking. Bookmark the permalink.